Tonic Design, a Raleigh-based architecture firm, won two of the seven Design Awards given out at last week’s AIA Triangle Awards. The firm was recognized for their work on the 1700 Glenwood Building, an iconic piece of Five-Points/Raleigh architecture, as well as Crabill Modern, located in Hillsborough. Originally built in the mid-1960s to house one of the most progressive drycleaners in the country, 1700 Glenwood has become a quintessential piece of the Raleigh architecture community even during an extended vacancy. After the owners were encouraged to undertake a renovation, they brought on Tonic Design to achieve a proactive architectural solution towards sustainability and an energy-efficient future. The building now shades its interior space from glare and reduces summer heat gain by more than 70%. Likewise, Tonic approached the Crabill Modern Residence with the goal of making innovative modern design accessible to a broader range of families. At a modest budget, they created a unique living space on a five-acre property in a clearing amidst a lush forest. Through imaginative architecture, they were able to create a unique live/work environment for the owners, a family of four. 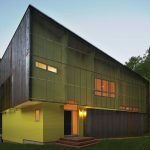 The house’s skewed cubic form is clad in Cor-Ten steel panels that act as a rain screen and sun shade. As time passes, the Cor-Ten will develop a rich patina that will liken rusted farm buildings in the area. “As time goes forward, we’re catching up to the past, in a way,” says owner John Crabill.